Today for fun I decided to try shooting an antique recurve bow at 65 yards (195 feet) on a windy day (gusting 15 to 25 kmph). Now it should be noted that antique archery equipment doesn't always stand up to the test when being shot for accuracy, especially at longer distances - but the bow in question is a true beauty. A 1975 Browning Wasp, a 50 pounder. On the right here is three Browning bows, all of them antiques. 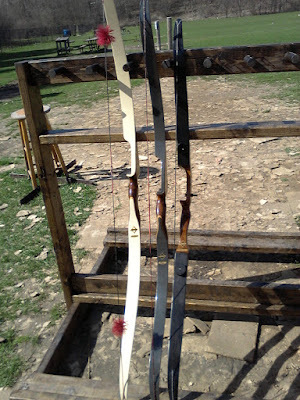 It was a rare coincidence when three archers with older Browning bows were all at the Toronto Archery Range together and we decided to take some photos of the three bows together. On the left is a 25 lb Browning Cobra. In the middle is my 50 lb Browning Wasp. 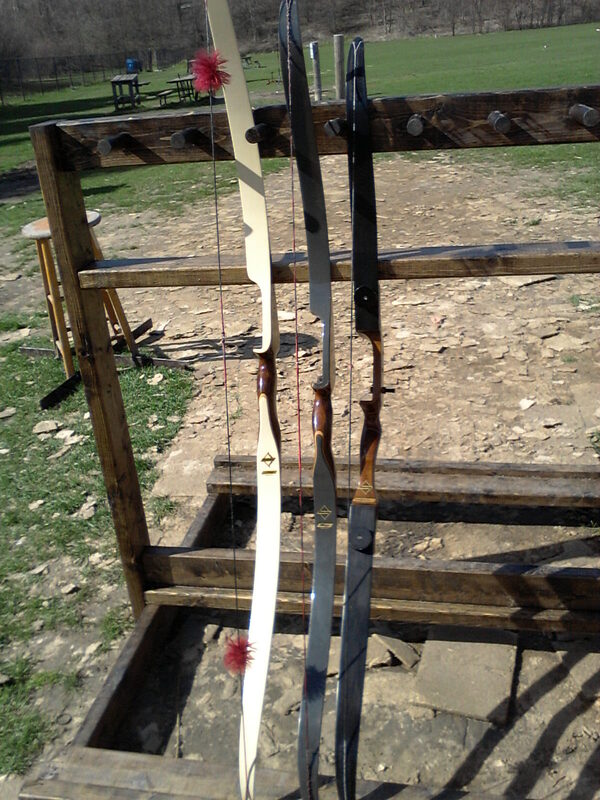 And the bow on the right is a 55 lb 3-piece Browning recurve bow (model name forgotten, I shall find out the next time I see the archer who owns it). Now you might wonder - why I am shooting such an antique bow? It is literally older than I am. Well, I firmly believe that the older bows are both beautiful to look at and will often surprise you with their quality and accuracy, even after 41 years like the Browning Wasp does for me. I have had bullseyes before at targets between 50 and 70 yards, so that is nothing new, but achieving that on a windy day - with a bow most people would be skeptical about - had me so happy I was grinning like a Cheshire cat and hopping up and down (as one friend pointed out later) like "a kid in a candy shop". Nothing like a long distance bullseye to make you very happy for the rest of the day. Note - I don't always get so excited about a single bullseye. It was the combination of wind, long distance, older bow and other factors that made that one shot so much more interesting. 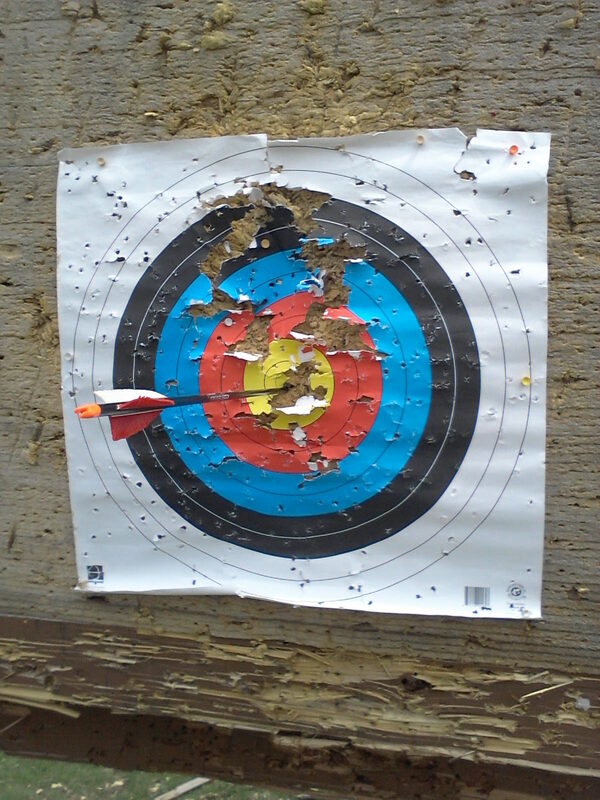 Maybe next time I shoot at that distance the wind will be more cooperative and I will get multiple bullseyes. Won't know unless I work at it. During the summers I routinely like shooting at longer distances because it forces the archer to concentrate harder on their goal in an effort to attain ideal form and thus execute more controlled and accurate shots. The added concentration levels of facing a difficult challenge I find is beneficial to improving the quality of one's accuracy. Below my bullseye of the day. Huzzah! If you are looking for archery lessons in Toronto or if you need some archery advice, feel free to ask.